Be the first to see footage from some of the company’s eagerly anticipated 2018-2019 horror films and hear from special filmmaker guests. Discussing movies on social media has become a blood sport instead of a forum for debate. Leonard Maltin and his daughter Jessie, who host the “Maltin on Movies” podcast for the Nerdist network, are willing to take on all comers who have a gripe over one of Leonard’s reviews. Marquis of Queensbury rules will be enforced, but anyone who wants to have a lively discussion is welcome to spar (verbally) with America’s best-known film critic. Warner Bros. Home Entertainment (WBHE) and the Arthur C. Clarke Society take a look back across a half-century (and the distant universe) to celebrate one of the most iconic films in history. Panelists will examine Stanley Kubrick’s science fiction masterpiece. Kubrick’s Academy Award-winning achievement is a compelling drama of man vs. machine, a stunning meld of music and motion. For the first time since its original release, new 70mm prints were struck from pristine printing elements made from the original camera negative. A longtime admirer of the late American auteur, Christopher Nolan worked closely with the team at Warner Bros. Pictures throughout the mastering process. Building on the work done for the new 70mm prints, the 4K UHD with HDR presentation was mastered from the 65mm original camera negative. 2001: A Space Odyssey will be available on 4K UHD from WBHE on October 30. Treyarch’s Jason Blundell (director, Zombies) and Craig Houston (lead writer) celebrate the 10-year anniversary of Call of Duty’s Zombies and discuss what’s next for the studio’s signature undead in Call of Duty: Black Ops 4. Get ready for never-before-seen footage, exciting special announcements, and Q&A. If you love toys and toy history, you’ll want to join Brian Volk-Weiss (show creator/director) and the TTTMU team Robin Henry (executive producer), Ben Frost (writer/editor), and Rich Mayerik (producer, toy collector) for the same brand of fun and informative toy-talk you’ve come to love from the hit Netflix series. Discussion will include a Q&A on what brought The Toys That Made Us to life, what the future holds, and maybe even a surprise or two along the way. In 2018, Spyro the Dragon is soaring to new heights in the Spyro Reignited Trilogy. This panel will connect Spyro’s creation with his present by giving fans an exclusive look into the creative process behind the original games from the ’90s and the 2018 remastered collection. Panelists include key members of the Insomniac Games and Toys For Bob development teams, Stewart Copeland (composer of the original Spyro soundtrack), and Tom Kenny (the voice of Spyro), and Michael John (Professor of Computational Media at the University of California, Santa Cruz, and former producer at Universal Interactive Studios), who will will share their unique experiences in creating and remastering one of the most beloved trilogies in platforming history. From the mind of George R. R. Martin, this new SYFY series is a psychological thriller set in the year 2093 that follows a team of scientists aboard the most advanced ship ever built. Their mission takes them to the edge of space but also to the edge of insanity, as they realize true horror isn’t waiting for them out there-it’s already on their ship. Unlike anything you’ve seen before, Nightflyers combines horror and science fiction in a way that Martin himself has described as ” Psycho in space.” The cast and creators hold an exclusive look into this exciting new series. Now entering its action-packed third season, SYFY’s Van Helsing continues the story of Vanessa Van Helsing and her band of heroes as they fight to reclaim the world after vampires took over during “The Rising.” Stars Kelly Overton, Jonathan Scarfe, Missy Peregrym, Aleks Paunovic, Rukiya Bernard, Vincent Gale, and Trezzo Mahoro, along with showrunner Neil LaBute and executive producers Mike Frislev and Chad Oakes, premiere exclusive footage from the upcoming third season and dish out tidbits from behind the scenes. Moderated by Bevin from Den of Geek. If you’re a millennial, chances are these panelists wrote the cartoons you watched as a kid. Paul Germain (Rugrats, Recess), Craig Bartlett (Hey Arnold! ), Sue Rose (Pepper Ann, Angela Anaconda), Holly Huckins (Recess, Angela Anaconda), Peter Gaffney (Rugrats, Ah! Real Monsters! ), Rachel Lipman (Rugrats, Hey Arnold! ), Matt Negrete (Pepper Ann), and Joe Ansolabehere (Hey Arnold!, Rece ss) talk about these iconic ’90s cartoons. Q&A to follow. Thomas Magnum is back on the case! Magnum P.I. is a modern take on the classic series starring Jay Hernandez as Thomas Magnum, a decorated former Navy SEAL who, upon returning home from Afghanistan, repurposes his military skills to become a private investigator. A charming rogue, an American hero, and a die-hard Detroit Tigers fan, Magnum has Juliet Higgins and her Dobermans to keep him in line, as well as his trusted buddies and fellow POW survivors T. C. and Rick when he needs back-up on a job. With keys to a vintage Ferrari in one hand, aviator sunglasses in the other, and an Old Düsseldorf longneck chilling in the fridge. Series stars Jay Hernandez, Perdita Weeks, Stephen Hill, and Zachary Knighton and executive producers Peter Lenkov and Eric Guggenheim present an exclusive sneak peek at the premiere episode of the CBS series, followed by a panel discussion. An all-new MAD ness is descending on San Diego! Meet some of your favorite classic contributors as well as some of the new California staff for music, inside scoops, and insanity! The Usual Panel of Idiots will include Doug Thomson, Suzy Hutchinson, Dan Telfer, Allie Goertz, Paula Sevenbergen, Sergio Aragonés, Tom Richmond, Luke McGarry, and Peter Kuper. As if high school wasn’t difficult enough already, imagine if every phone in your town was hacked, the contents shared for all to see, and you and your three best friends were framed as the hackers. Welcome to the explosive world of texting, terror, and teen-angst that is Assassination Nation. Already dubbed “the most aggressive high school movie in film history,” Assassination Nation is being brought to the big screen by the Russo Brothers (Avengers: Infinity War, Captain America: Civil War), who will be joined by director Sam Levinson and the film’s stars Bill Skarsgård (It), Suki Waterhouse (Insurgent), Hari Nef, and Abra for an exclusive look at what is sure to be one of the most controversial and cathartic films of the year. Tom Clancy’s The Division 2 creative director Julian Gerighty and other members of the team take you on a journey through what it takes to bring the post-pandemic world of The Division 2 to life in-game. Learn how the Division narrative is constructed with the vision of expanding through comic books, novels, and other entertainment. 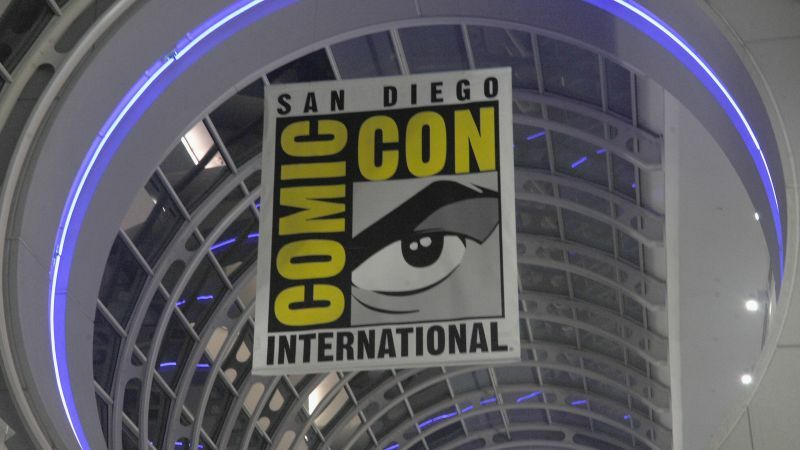 The post Comic-Con 2018 Schedule for Thursday, July 19 appeared first on ComingSoon.net.